Now, here’s a story that warms my heart: a recent survey commissioned by Two Sides showed that people prefer to read print communications rather than on a screen. As a print designer—and someone who still gets excited when a magazine arrives in the mail—this makes me happy. And now that I’m a new mom, I’m buying more books than ever. Frankly, I would rather have my infant chew on a colorful board book than an iPad. And according to this story by Two Sides, I’m not alone: most parents agree that children should read good ol’ fashioned books, not electronic gadgets. So keep on buying those books or hit the library. And don’t stop sending brochures or direct mail to potential clients—just be smarter about it. Use a smaller page size, print a lower quantity, link to detailed information on your website, clean up your mailing list to include only true prospects. Thanks to Print in the Mix for sharing this story. Have your print habits changed? Share in the comments! Though the last few years have seen an increase in digital and online marketing channels, people are now realizing: paper sells. Whether it’s a direct mail piece, catalog or marketing brochure, printed pieces are a way for businesses to stand out in the digital age. This is great news for a print designer such as myself. I do strive to be be green, going paperless when possible. But being a longtime fan of paper (OK, paper junkie), I can’t deny the joy of seeing a printed brochure or announcement on a fabulous paper I selected. And why not use paper? 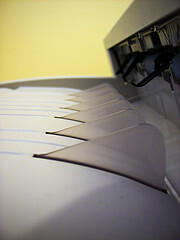 Most paper companies have responded to customers’ requests, offering environmentally-friendly options. Designers can create a design that uses less paper more creatively (saving trees and money). And there’s no substitute for experiencing the tactile quality of a printed piece. According to the recent Deliver Magazine, direct mail generated the majority of donations to nonprofit organizations in 2009. Marketers are also realizing the value of combining print with online channels. Several paper companies have launched recent campaigns to promote paper. NewPage Corporation launched the “Paper Sells More Product” campaign, giving away $100,000 in print services to help catalogers, magazine publishers, and retailers sell more product. Domtar Paper launched the “PAPER Because” campaign to highlight the key role paper plays in our lives and the reasons why it’s an environmentally sound choice. Several paper and printing companies have also partnered with The Print Council. By providing education, awareness and research, they aim to promote the importance of print and the role it plays in your business’ media mix. So, when you work on your next marketing or promotional campaign: think paper! As I pack up my office for my move, I’m inspired to spruce things up in the new digs. I’ve already replaced my unattractive, vinyl 3-ring binders binders with cool-looking, recycled ReBinders, but I thought I might pick up some more attractive office supplies—many of which have the added bonus of being good for the environment. Packing tape: decorative packing tape from Fancy That! Why should kids be the only ones to get brand-new school supplies? At the Unisource Paper Show in Chicago last year, I was delighted to discover lots of new paper stocks for digital printing—and thrilled that many of them were also recycled (30–100% PCW). As many small businesses are printing short runs digitally—or even printing in-house on their trusty laser printers—I thought I would share my digital paper discoveries. Digital papers can be purchased online either directly from the paper mill or at online retailers such as The Paper Mill Store. Some papers are available at local retail stores too. Check each paper manufacturer’s site for specific purchase information. Print no more on boring white laser paper!